Anyone who’s driven through rural areas can paint this picture – you’re cruising on back roads surrounded by corn fields and notice a lake off in the distance. Instead of noting its beauty when you pass by, all you can see is the thick layer of green sludge coating the surface of the water. A lake about ten minutes from my house suffered from this very problem. My dad and I used to stand on the docks and go fishing there, but year after year the water seemed to get more murky and the fish less plentiful. The algae eventually grew to be so thick that our fishing lines would no longer sink to the bottom. It looked like someone had poured that green Nickelodeon slime all over the top of our favorite fishing spot. What had happened over the years? How did that green muck get so thick that we couldn’t fish anymore? It wasn’t always like that, so I couldn’t help but feel that something was very wrong. Research published in the Journal of Environmental Sciences suggests a reason why. This study found that chemical runoff from farmlands and pollution from large cities feeds nutrients (specifically phosphate and nitrate) into surrounding waterways, causing uncontrolled algae growth on the water. 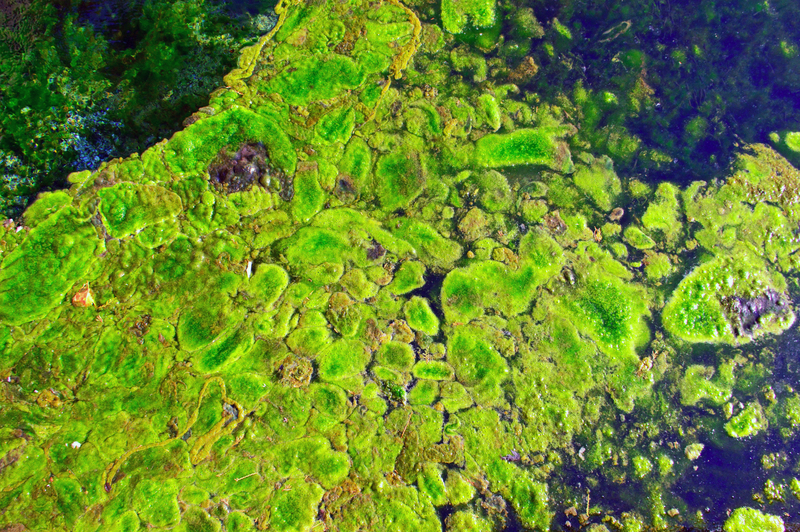 These algal blooms block sunlight from penetrating the water, thus preventing photosynthesis from occurring in the plants underneath the surface. Without photosynthesis, the oxygen levels of the water decrease. These underwater plants convert carbon dioxide in the water into oxygen by using energy from the sun. If sunlight is eliminated from the photosynthesis reaction, there is no way to convert light energy to chemical energy in the form of oxygen. So, what’s the big deal if oxygen levels decrease? Well, if oxygen levels get too low, the water can become anoxic, meaning that there is not enough dissolved oxygen in the water for aerobic organisms to use. Life forms like our beloved fish friends need that oxygen to breathe. If there’s no oxygen, then the fish die! It’s as simple as that. This study, conducted in China, assessed oxygen concentration and eutrophic levels of the Fuyang River and its tributaries in both heavily populated and mildly populated areas. Water samples were taken regularly over the course of a year. The dissolved oxygen content was measured and a numerical eutrophic level was recorded for each of the samples. Results showed that the water was classified as dangerously eutrophic in both urban and suburban areas, but was slightly worse among the urban cities. Moreover, the dissolved oxygen content was so low that it was unsuitable for wildlife. This begs the question, how do we fix this issue? Tragically, there is no surefire way to go about it. Our town decided that the best way to fix it was to drain the entire thing and refill it over time. My dad and I got our fishing spot back temporarily, but I still fear that history is going to repeat itself. It has worked out pretty well thus far, but draining a body of water isn’t always the most viable or reliable option. The most obvious solution is to stop chemical runoff and attempt to reduce pollution through the use of greener energy sources, but huge corporate agendas will never allow that to happen. One possible way to solve the issue is by actually manipulating phosphate and nitrate concentrations manually to try to neutralize their impacts. By attempting to counteract the effects now, we can hopefully prevent an ecological disaster in years to come. If we can fix the eutrophication issue, we will be able to reclaim our lakes and ponds for recreational use. Additionally, the overall biodiversity and health of life forms, like the fish we consume, would improve exponentially. Zhang, W.; Jin, X.; Liu, D.; Lang, C.; Shan, B. Temporal and spatial variation of nitrogen and phosphorus and eutrophication assessment for a typical arid river — Fuyang River in northern China. Journal of Environmental Sciences 2017, 55, 41-48, DOI: https://doi.org/10.1016/j.jes.2016.07.004. Schindler DW, Hecky RE, Findlay DL, Stainton MP, Parker BR, Paterson MJ, et al. Eutrophication of lakes cannot be controlled by reducing nitrogen input: Results of a 37-year whole-ecosystem experiment. Proceedings of the National Academy of Sciences. 2008;105(32):11254-8. Hey guys, my name is Mia DiFrancesco and I’m a sophomore Biology/Pre-Med major. I’m from Buffalo, New York, just a few hours northeast of Pittsburgh. I plan on earning my B.S. in Biology with a minor in Biochemistry, and I hope to attend medical school upon graduation from Duquesne! I enjoy skiing, playing basketball, and spending time with friends and family.